Download the U-Scan App Now! Vehicle OBD-II diagnostics made easy with your iPad or iPhone. NEW automotive scan tool on your smartphone! 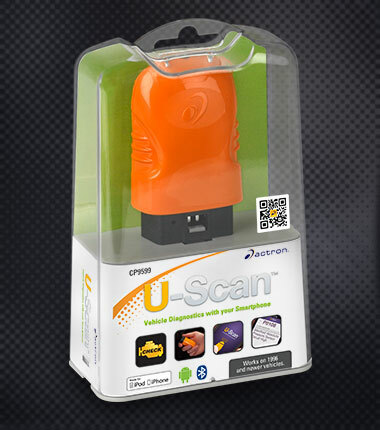 U-Scan vehicle diagnostics using a smartphone, providing essential information to help you fix your vehicle quickly and easily all while saving you money. Get the reason to the cause of the check engine light. Simply plug in the adapter in your car and read the definitions for the codes that caused the check engine light to come on. See results on your Android or Apple smartphone. U-Scan gives reliable trouble cosde information with CodeConnect. The CodeConnect database includes over 4.3 million Fixes of problems that caused the check engine light to flash on. The fixes are verified by ASE certified technicians. Fixes are prioritized with the most probable solution to the problem at the top of the list. The fixes are specific to the vehicle’s make, model and year. Display and graph LIVE data sensors, RPMs, coolant temperature and more for a faster diagnosis.